Walmart has the Matney Foam Floor Puzzle-Piece Play Mat on sale for $11.79 (regularly $35). Nine interlocking pieces can be mixed and matched to evolve with your needs or for interactive playtime. 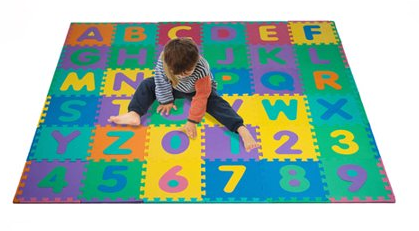 Large, cushioned and colorful puzzle pieces are very safe — the foam matting allows children to play and jump around without worrying that they might fall on a wood or hard surface floor. They also have a 96-Piece Foam Floor Alphabet and Number Puzzle Mat on sale for $19.99 (regularly $31.16). This floor puzzle mat features 36 colorful foam tiles, including 26 pop-out letters and 10 pop-out numbers. Each tile is large enough for tiny fingers to easily manage and manipulate. When arranged flat, this floor puzzle mat covers 36 square feet including the border. Each piece measures 12" x 12". 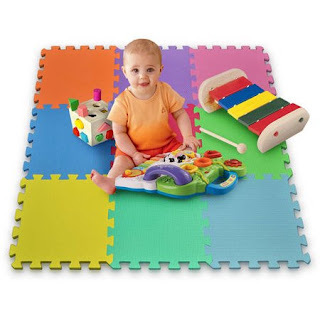 The tiles in this foam puzzle mat interlock and can be arranged for flat or three dimensional building fun.